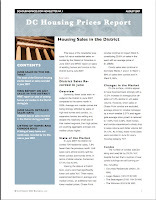 I haven't updated the blog for the past few days because, when I wasn't enjoying the weekend at Rehoboth Beach, I've been busy putting the final touches to a long planned offering, the DC Housing Prices Report. As I've mentioned in the past, I have a database of more than 60,000 home and condo sales recorded in the District since 1999. I've used this data in writing the monthly sales analyses I've posted on this blog. In keeping with my efforts to make information more freely available to District home buyers, I've decided to publish my data so that others can use it as they research and prepare to buy their own homes. A summary of the past month's analyses from the blog. The data tables used in the month's analysis. And, I believe most importantly, a listing of almost every home and condo sale recorded in the District that month, sorted by zip code and, within each zip code, by housing category and price. I don't believe this type of sales data is available in this format from any other source in the District, aside from a real estate agent. And while a real estate agent will provide listings information, they will rarely provide past sales information to a client, at least in as comprehensive a manner as is available through this report. For example, in the report I'm publishing today, the 704 sales recorded in June span 48 pages encompassing up to 22 zip codes. 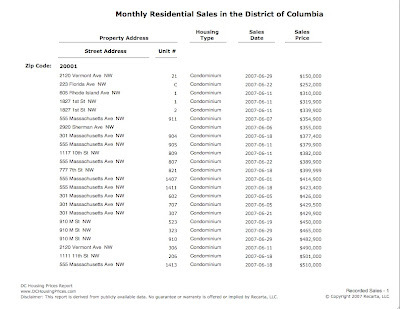 The report is available for purchase and download under the "DC Housing Prices Report" section on the right side of this page; click on "Add to Cart", you'll be transferred to Paypal, and the PDF file [~1.7MB] should then be automatically downloaded to your PC/Mac. However, this does not mean I will no longer blog my analyses of current housing prices and trends in the District; I'll continue to do so. I'm simply using another channel to provide more detailed information to those who want it.